The ability to monitor power factor (PF) as part of overall energy use can be extremely useful in planning and implementing energy saving initiatives in high consumption facilities. Choosing an energy monitoring device that has the ability to measure power factor is important in gaining an accurate overall picture of energy usage and planning efficiency measures. Power factor is a measurement of how efficiently electrical power is consumed. In high consumption premises, the operation of plant and equipment such as motors, compressors, welding sets and even fluorescent lighting can introduce varying levels of electrical inefficiencies in the form of additional currents called 'inductive reactive currents' into a site's electrical supply. The power dissipated in a load is the product of the voltage and current. If a load is purely resistive, the voltage and current are in phase and all the power can do useful work. If a load has a reactive component (i.e. has capacitance or inductance) the voltage and current are not in phase. The reactive load causes current to flow but it can do no useful work. The relationship between resistive (real) power and reactive power can be described by the power factor or phase angle. A purely resistive load has a power factor of one and a phase angle of zero (i.e. there are no electrical inefficiencies). A purely reactive load has a power factor of zero and a phase angle of 90. 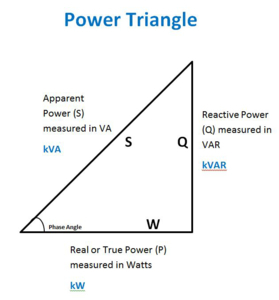 The relationship between apparent power, real power and reactive power can be represented in the power triangleshown here. Most loads have a component of each: ideally in terms of consumption, electrical efficiency would be around 1.00 PF (100% electrically efficient), however in a typical commercial or industrial site this inductive loading can cause it to be reduced to around 0.80 (i.e. 80% electrically efficient). Low power factors are not desirable. If a load has a low power factor, more current must be supplied by the utility company than is actually needed. This means heavier equipment, inefficient use of energy and adding to the cost of electricity. Organisations with a poor power factor are likely to be charged a premium for power by the utility company. Therefore organisations with a low PF may well be wasting both energy and money: when it falls below a set figure, electricity companies will have to supply extra (kVA) to make up for the loss caused by poor power factor. They will often apply an additional charge to the KW being consumed, or the whole supply may be charged as kVA. In addition to saving energy and reducing costs, as the power factor of a system is improved, the release of electrical capacity means that the total current flow will be reduced. This permits additional loads to be added and served by an existing system. In making an assessment of overall energy efficiency, it is important to use an energy data logger that records not only single and three phase power usage, but also power factor. The ability to measure PF in a facility will indicate how effectively electrical power is being used. This will enable corrective measures to be introduced which can target the inductive reactive currents, counteract the inductive element of the load and increase electrical efficiency to nearer the ideal target of 1.00 power factor. Power factors can be corrected/improved by the installation of newer equipment including dedicated integrated circuits, or installing specialist equipment. Some low end instruments only measure current and then assume that the voltage is fixed. They also assume that the power factor is 1.00, as they are not connecting to the voltage and comparing its timing with the current flow. Therefore this can present a very inaccurate picture of actual electricity usage. To present an accurate measurement of power usage, it is important to choose an energy logger that measures both voltage and current usage and correlates the timing between the two to measure the power factor. The Tinytag Energy data logger is a useful tool for identifying and evaluating energy saving measures. Cost-effective, non-invasive and easy to use, it monitors single and three phase power usage, and power factor, and can be used for spot checks or left to record for longer periods to help build up energy profiles throughout an organisation.